Reports reaching us say heavy gunfire is ongoing around the vicinity of the Presidential Villa and the headquarters of the Department of State Services in the Asokoro District of Abuja Nigeria. Premium Times reports: that the shooting has been on for the past one and a half hours this Sunday, March 30, 2014, security sources and residents of the area said. Residents in the area have been advised to stay indoors as men from the SSS are seen scampering out of their headquarters. The expansive headquarters of the State Security Service popularly known as Yellow House, is almost adjacent to one of the remote gates of the presidential villa. Residents of the nearby Aso Drive Area said the gunshots were either coming out of the SSS headquarters or the presidential villa. A resident of the area said, “We don’t know what’s going on here. Heavy gunfire has been coming from the direction of the villa. The entire area has been barricaded. SSS operatives are scampering out of their headquarters as the gunshots get louder. “Soldiers are now heading in the direction of the SSS headquarters with Armoured Personnel Carriers. 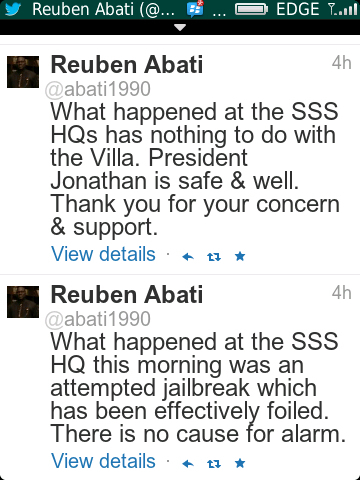 The Special Adviser to the President on Media and Publicity, Reuben Abati could not be reached for comments. But the spokesperson of the SSS, Marilyn Ogar said the gunshots were triggered by attempted jailbreak at the Service’s headquarters by suspected members of the extremist Boko Haram sect. here but suddenly they attacked him with their handcuffs, disarmed him and started shooting. “The military was quickly called in before they could do any harm and that is responsible for the shootings you heard.